Some people just don’t want to grow up. Those with supportive and present families may be pushed more to get their acts together and make something of their lives, while those who are mostly alone assess their own progress, which can still lead to success if the motivation to achieve something is there. For those without that drive, it’s easy to reach a moment where time has suddenly flown by and little has changed during it. Recognizing when that is may take the objectivity of an external source, and those who are told they’ve become stagnant may not be at all open to hearing that feedback or doing anything to change it. 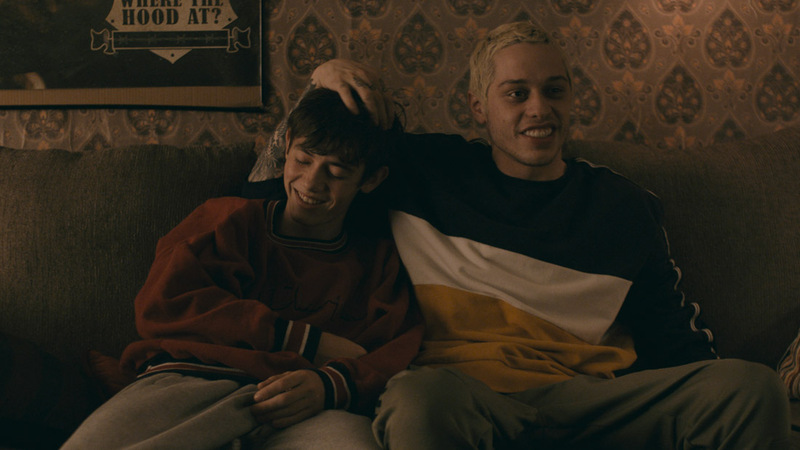 Mo (Griffin Gluck) looks up to his older sister’s boyfriend, Zeke (Pete Davidson) as a young kid, and when they break up, he continues his friendship, spending nearly all of his time with the drug-smoking, hard-drinking partier who hasn’t made much of his life. As his father (Jon Cryer) years to spend time with him, Mo continues hanging out with Zeke, even venturing into casual drug dealing at high school parties. Smitten with a girl in his class, Sophie (Oona Laurence), Mo turns to Zeke for advice, as he gradually learns that his best friend may not in fact be the best role model. A character like Zeke is hardly original, but “Saturday Night Live” player Davidson makes him a hilarious and occasionally endearing figure, one who almost always says and does the wrong thing but expresses such a natural confidence about it that it somehow feels believable and even at times excusable. Opposite him, Gluck has plenty of awkward charm, trying to be cool while mildly recognizing the disparity in his life and potential and that of his best bud. In the supporting cast, Sydney Sweeney, doing a full turn from her performance as a devout follower on “The Handmaid’s Tale,” shines as Zeke’s girlfriend Holly, who likes Zeke but can also see the big picture of what Mo’s future holds. While drugs and alcohol are consumed freely throughout this film, it’s not accurate to describe it as a stoner comedy. The term “coming of age” feels more appropriate, but mostly it’s a film about friendship, and about how Mo views Zeke, who he says early on never treated him like a kid, with admiration. That does become more problematic as they get older, and Mo starting to realize that is crucial to his own growth. Overall, this film is full of laughs, and any points it may get off for not being wholly innovative it earns back for nailing its characters and making them feel real and rich.